Last weekend, TowerMUN sent a delegation of 14 students to AmeriMUNC, a Model UN Conference hosted by American University International Relations Society. This unique conference features an interconnected simulation, meaning that the actions of any delegate or committee can impact all committees. The diplomatic theme of this year’s conference was "The Pacific in Crisis." All students, including many first-time delegates, performed well at the conference. Committee chairs praised students’ creative ideas and confidence with public speaking. 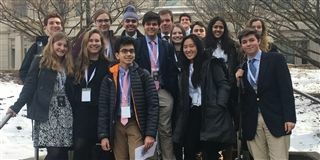 Joseph Pinto '19 earned the title of Outstanding Delegate for his role as the Federal Republic of Germany in DISEC, the committee that addresses disarmament and international security. Thomas Zehner '20 was named Outstanding Delegate for his representation of Wilbur Ross, Secretary of Commerce, in the United States cabinet. Pinto also received his committee’s Diplomacy Award. This award, determined by the participants, reflects Joe’s collaboration and problem solving.